How much does Paymo cost? You can choose from 3 different plans depending on your needs. 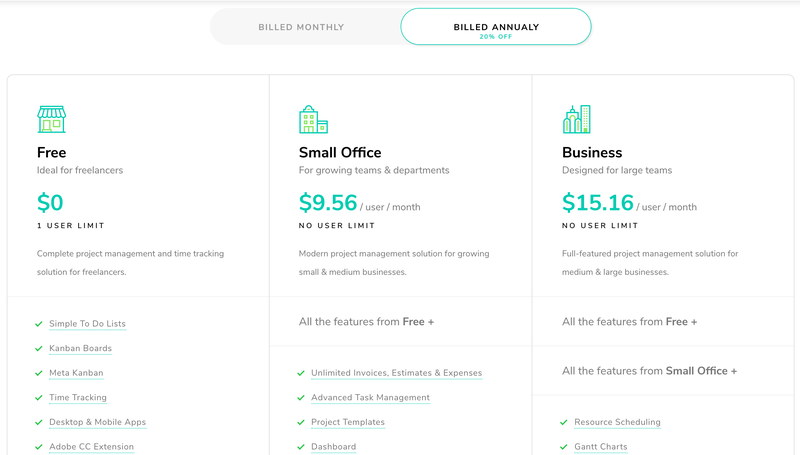 The Free plan is mostly designed for freelancers. The Small Office plan starts from $9.56/user/month and is designed for smaller teams. The Business plan starts from $15.16/user/month and is designed for larger teams that need features like Gantt charts and Team scheduling to have a better overview of how the projects evolve. If you wish to go with the annual plan, you will get a 20% discount compared to the monthly subscription. Note: You can't have different pricing plans in the same company account.